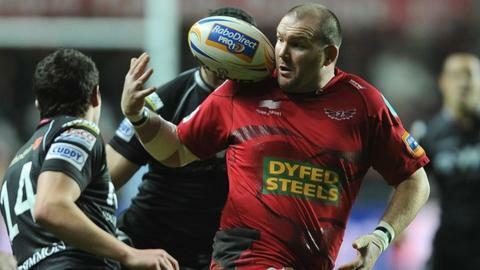 Prop Phil John has signed a contract extension to remain with Scarlets for the 2015-16 season. The loose-head, 34, joined the Welsh region in 1999 and has gone on to make over 300 appearances. He has also played for feeder clubs Llanelli RFC and Llandovery RFC. Scarlets head coach Wayne Pivac said: "We have a number of young local boys making a name for themselves and being able to call on a player of Phil's experience is beneficial to us." John is the latest player to extend his contract with Scarlets, following Liam Williams, Ken Owens, Rob Evans, George Earle and Lewis Rawlins. Wales stars Rhodri Jones, Samson Lee, Jake Ball and Scott Williams are also remaining with Scarlets after signing national dual contracts. Additions to the Scarlets squad are Glasgow and Canada winger DTH van der Merwe, outside-half Aled Thomas, tight-head prop Will Taylor from Wasps, lock Tom Price from Leicester Tigers and Wales-qualified loose-head prop Dylan Evans.